The political origins of modern Canada lack a single defining moment such as a revolution; the achievement of responsible government, which occurred over several decades, seems prosaic by comparison. For many late-19th- and early-20th-century historians in British North America, however, it was seen as part of the supposedly inevitable march of human progress. 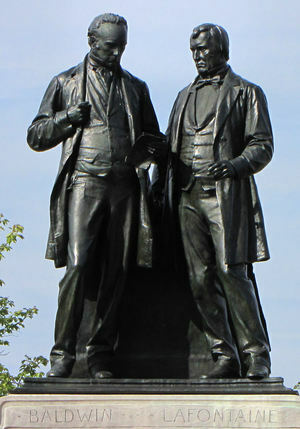 In the 1890s, for example, the Whig historian William Kingsford assumed that “responsible government was the unifying heritage of all British North American colonies, and that ultimately Canada was one nation composed of a single people inhabiting a common land.” Yet the 1841 elections and subsequent administration (1842–43) of the two politicians most often associated with responsible government – Robert Baldwin and Louis-Hippolyte La Fontaine – were neither the pre-ordained acts of a Whig providential deity nor the definitive starting point for an exploration of modern Canada’s political genesis. During the 18th century Great Britain had a mixed constitution in which the monarchical element was balanced by an aristocratic one (the House of Lords) and a representative one (the House of Commons). The British North American colonies also had representative institutions: Nova Scotia from 1758 [see Charles Lawrence], St John’s (Prince Edward) Island from 1773 [see Walter Patterson], New Brunswick from 1784 [see Thomas Carleton], Lower Canada and Upper Canada from 1791 [see Sir Alured Clarke; John Graves Simcoe], and Newfoundland from 1832 [see Sir Thomas John Cochrane]. The property qualification that severely restricted the franchise in Britain had the opposite (and unintended) effect of broadening it in the pre-confederation colonies [see Winning the Right to Vote]. As a result, colonial legislative assemblies had representatives from classes whose members were largely excluded from the British House of Commons. Between the 1780s and the 1830s the colonial assemblies used a variety of stratagems to win the political initiative from their non-elected legislative counterparts. Here was the crux of the matter [see Provincial Justice: Upper Canadian Legal Portraits] – placatory gestures would not alter the constitutional structure of colonial governments. Favoured by most reformers (with the notable exception of William Warren Baldwin), elective legislative councils (which would transform government) were anathema to colonial tories such as John Beverley Robinson. In 1836 Gosford made attempts to conciliate Lower Canada’s assembly with new appointments to the executive and legislative councils that were favourable to the assembly; Lieutenant Governor Sir Francis Bond Head acted similarly with the Upper Canadian executive council that same year. Yet these actions failed to resolve the underlying problem concerning the relationship between government administrators, advisers, and the executive on the one hand and the elected assemblies on the other. In 1842 Sir Charles Bagot admitted to the colonial secretary that responsible government, in fact, existed [see The Colonial Office and British North America, 1801–50], and the mission of Lord Elgin [Bruce] in 1847 was “to elaborate and confirm the practice of responsible government in the British North American provinces.” Its achievement was formally recognized, first in Nova Scotia, and then in the Province of Canada (created by the union of Upper and Lower Canada); by 1855 responsible government could be found throughout central and eastern British North America. There was nothing predestined about the realization of responsible government in what would become Canada. It gained momentum with the rise of organized public opinion fostered by newspapers and political associations; it gathered strength from the increasing power of the elected assemblies; it developed a political language that evolved and adjusted according to changing circumstances; and it achieved a political focus derived from the collective experience of opposition politics and the apparent possibilities of the immediate post-rebellions period. The search, which had been a haphazard one, for a form of government that was broadly accepted, and thus legitimate, resulted from numerous acts of political judgement by individuals and groups (with ever-changing alliances) in all the colonies over many decades and in response to new situations. In the end, responsible government altered the structure of politics by shifting the fundamental source of legitimacy and power to the elected assemblies. Tories such as John Beverley Robinson and Thomas Chandler Haliburton had predicted such a development – “the age of gentleman administrators was over” [see John Macaulay]. To learn more about responsible government, we invite readers to consult the biographies contained in this collection of biographies.